Use this Excel macro to create appointments in different subcalendars in Outlook. To use, type the appointment data in the rows and then run the macro. The macro processes all rows that contain data in Column A, creating appointments using the data in the other columns. To use, create a spreadsheet with the fields in this order: Calendar Name, Subject, Location, Body, Category, Start, Start Time, End, End Time, Reminder. Set Excel's VBA security to low, then paste the macro into Excel's VBA editor and run the macro. The calendar's listed in Column A need to exist, Outlook won't create them. This is an Excel macro. You'll also need to set a reference to the Outlook object model in Excel's VBA Editor's Tools, References dialog. A version of the macro that skips previously imported events is here. A sample workbook is here. 'MsgBox subFolder, vbOKCancel, "Folder Name"
MsgBox "An error occurred - Exporting items to Calendar." To use, create a spreadsheet with the fields in this order: Subject, Location, Body, Category, Start, Start Time, End, End Time, Reminder. Set Excel's VBA security to low, then paste the macro into Excel's VBA editor and run the macro. This Excel macro is used to create an appointment using the data in the selected row. To use, select a cell in the row you wish to use then run the macro. Use this macro to send meeting requests. Do not use a location if you are adding a resource. If your CSV has the fields in a different order, change the column number in in the appointment code, for example: .Body = Cells(i, 3). If you need to send it to multiple addresses, you'll need to use the split function then loop the attendee code to add each address separately. To check your macro security in Excel 2010 or newer, go to File, Options, Trust Center and open Trust Center Settings, and change the Macro Settings. Paste the macro in Excel and run. Thank you - does it matter were in the code I put it? I'm not sure what you are talking about - but yeah, it probably does. I have set a reference to the Outlook Item as listed about but I still get this message. Is there something else I can do that I am not? Also - I have changed/renamed entries to match my spreadsheet. I have attached I here can you take a look and tell me if I am on the right track? 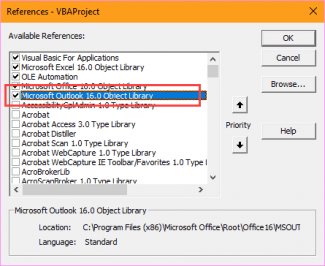 so you still got the error after setting the reference to outlook object library? that should fix the error. Thanks a lot for the code that's brilliant. my knowledge is quite limited with VBA. I am using the "Send Meeting Requests" code and i was wondering is it possible to make them appear on a shared calendar, instead of my calendar? Sure, as long as you have the proper permissions. You'll need to use the code at https://www.slipstick.com/developer/working-vba-nondefault-outlook-folders/#shared to get the owner. Thanks for the great code but I am having the same issue as James Wong. The code works great to send appointments from my default calendar but when I try the Set CalFolder = olNs.ActiveExplorer.CurrentFolder I get Run-time error '438': Object doesn't support this property or method. Any suggestions why? Using Outlook 2016 if that matters. I am trying to schedule the appointments in a sub calendar named "Test-ACSDI and have it open. as long as a calendar by the same name exists as a subfolder of the selected calendar, it should work. The error seems to say the folder is not a calendar though. '.End = Cells(i, 7) + Cells(i, 8) '+ TimeValue("10:00:00"). Any ideas on what I could be doing wrong? Thanks in advance for your help! If the value is in the cell is coming over as a date (use debug.print Cells(i, 5) + Cells(i, 6) to see how its coming over), it can still work... but you need to know the value outlook sees in the cell. It's definitely better if the format of the cell is what outlook is expecting. Thank you for responding so quickly! I think I may be doing something wrong... I put some slides together to show what happens when I try to use the Start time and End times in the Macro. If I don't use them, the macro works, however I cannot set the times. Please let me know if you have any suggestions :) Thank you! i'll need to see the code. You can paste it into a text file and attach it to a comment. First off, thanks for sharing this very helpful piece of code! Really works great. I have it in use on a couple of spreadsheets and it makes planning a lot easier. Via a userform it is possible to select subjects, the userform in return hides all the rows that are not selected. This leaves only a couple of rows visible. How do I get this code to use only the visible rows when adding to the calendar? Just to clarify as I think I wasn't to clear on this. After making a selection from the userform with all the subjects, a list of variable rows is left visible. (for example, rows 4-10, 12, 14, 21-25 etc) These in return will become the calendar appointments. the line i gave you picks the second visible row (first would be the header row). You could use it to set the row value in your code, although it looks like it needs some work. I thought your latest piece of code had to replace the line behind the ''Do Until'' but this is giving me the error I mentioned previously. Further help would be greatly appreciated! should do it, then you need to work down the it. I don't know if i will have time to test code that does it before the end of the year though. it didn't work for some reasons. Any error messages? What happened when you tried? Find and comment out all on error resume next lines and run it- see if it triggers any error messages. Without an error message, its really difficult to know why its not running.